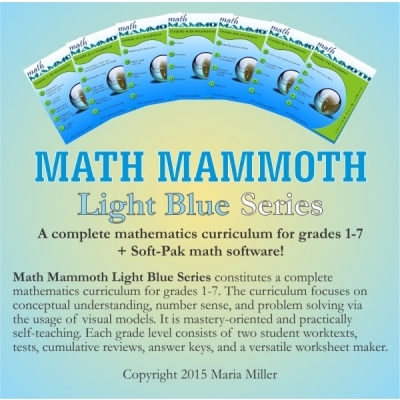 Math Mammoth Complete Grades 1-7 Math Curriculum Only $180! You are here: Home / Educents / Math Mammoth Complete Grades 1-7 Math Curriculum Only $180! Right now at Educents, you can snag the Math Mammoth Complete Math Curriculum for only $180! Coupon codes do not apply to this product. This math curriculum is mastery-oriented and organized into chapters by topics. This set contains full curriculum for grades 1-7. That makes each grade level only $25 each! Each grade level consists of two student worktexts (A and B), which contain both the teaching (explanations) and all the student work (exercises). Also included are answer keys, tests, cumulative review lessons, and a versatile worksheet maker (Internet access required). Click here to see the full Math Mammoth deal!